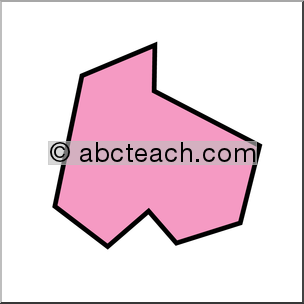 A polygon is a closed 2 - dimensional shape made of straight lines with 3 or more sides. Triangles and rectangles are polygons. These are irregular pentagons - each shape has 5 sides but the lines and the angles do not have the same measurement. Triangles are polygons as well. They are a closed shape with 3 or more sides. There are regular and irregular polygons. Can you guess what the equal angles are?